Monteverdi's first opera changed the course of our music, as musical director Paul Agnew says in his short but very valuable commentary. Through the composition of his five books of madrigals up until 1605, the composer effectively practiced and perfected the wide range techniques and modes of expression he would use in L'Orfeo. The instrumental and vocal requirements of the opera are not clear in the composer's instructions, says Agnew, so decisions have always had to be made to fit the work to the available performance space. History suggests that the initial performances were given in a fairly small salon in the ducal palace at Mantua: enough space for little more than accompanied madrigals. Les Arts Florissants have therefore chosen to treat the work as if it were a prolonged madrigal. There is just one singer to each part for choruses and above all every note of music is dedicated to the clarity of the text. In music of this period the words are paramount and must be heard and understood. Every emotion stated in those words must be conveyed to the listeners. The instrumental accompaniments are simple but varied with several continuo instruments adding colour to the strings, flutes, cornets and trombones. This production uses a single set, a stone circle dedicated to Apollo the sun god. This serves as both the earth and the kingdom of darkness, the two domains in which the action takes place. It is obvious that the members of Les Arts Florissants have, by these means, been wholly successful in conveying this simple and tragic tale of loss and atonement. 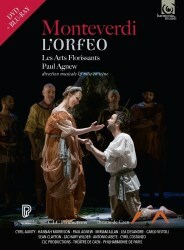 So I have to declare this spectacularly fine L'Orfeo to be one of the most beautiful and affecting productions I have ever seen. The singers are magnificent, particularly the principal roles: Cyril Auvity (Orfeo), Hannah Morrison (Euridice/La Musica) and Lea Desandre (Messaggiera/Speranza). The opening scene and the moment when Euridice's death is announced are just two examples of excellence and there are plenty more involving other members of this remarkable cast. The singers and instrumentalists mingle on the central stage with additional players at the sides. There is no separate space for the orchestra who are all costumed and often take a significant part in the action. This, for me, is a miracle of operatic production because nothing comes between the viewer and the musical performance. No stage director is grinding political axes here. Thank you to Paul Agnew and his production team who have, as the sleeve note says, deposited us into a painting by Nicolas Poussin. The lighting plays a significant part when the domains and moods change. This too plays to the strength of Monteverdi's great opera. Harmonia Mundi has seen fit to issue both disc formats in the one box at a bargain price. There are unfortunately some technical issues with the Blu-ray disc. One issue is that it seems only to have DTS MA high definition surround, no PCM stereo is listed, and similarly the DVD does not list stereo, only DTS surround. A second small issue is the presence of stray characters in the English subtitling. For example, question marks turn up unexpectedly in the middle of sentences. Some sort of character encoding error I would guess. It is only a minor disturbance. A more significant disturbance is the amount of Blu-ray motion judder. (see http://www.projectorcentral.com/judder_24p.htm for a useful explanation). This occurs when anything moves horizontally, for example a performer runs on from the side of the stage and appears as a series of rapid jerky images. It is possible your playback system may handle it differently. I nonetheless watched it all twice, held (mostly) spellbound by the opera. The DVD suffers less but the pictures on DVD are so inferior as to be unwatchable after seeing the beautiful HD quality on Blu-ray (judder apart).